I’m going to say something really obvious here (just warning you), I can’t believe I’ve been posting on this blog for four whole years! I feel like its a massive milestone for me, and also a time to reflect. I do find that I tend to get a little obsessed about the stats on my blog. I love to watch the numbers increasing, the numbers of followers, pages views and likes on facebook, but that is not a REASON to blog, and I think it can distract me from my reasons I started and continue this blog. I read a lot of books, and I like to share with you the ones that I think will be useful. I know that there are many things that you need to learn by doing rather than reading, but I still learn an awful lot from reading! You can find all my book reviews here, also please see my Amazon book shop (links to a page on my blog) if you want to browse the books I recommend. If you purchase through my site I get a small percentage as Amazon book vouchers (so it goes straight to buying more books for me to review!) and it doesn't cost you any extra. As we all know, simple living is not simple! Here's all the posts I've shared about the things going on in our life and what we try to do to increase our self-reliance and preparedness. On our farm we have dogs, cattle (the house cows being a special category) and the chickens (also guinea fowl until recently). They all offer entertainment and learning opportunities. This is what I wrote about our animals in 2014. 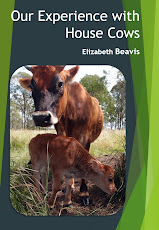 And my ebook "Our experience with house cows", available over at my house cow ebook blog. Lemon balm (Melissa officinalis) is part of the mint family (Lamiaceae), and even though I already wrote about mint, peppermint andspearmint in my garden, at the time I didn’t have lemon balm. I only recently got a cutting from Pete’s parents and its doing really well in my garden now. It hasn’t flowered for me yet, but apparently the genus name (Melissa) is Greek for 'honey bee', because the flowers attract bees. 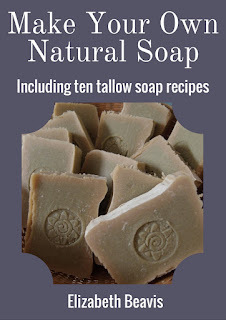 November is over and I'm joining in the Slow Living Monthly Nine, started by Christine at Slow Living Essentials and currently hosted by Linda at Greenhaven. Here's what we got up to November in our "slow life"! Prepare I've been sewing on buttons, mending holes and adjusting hems. I think these are all very useful skills and its good to practice them, I've been sharing a few tips along the way. I'm looking forward to taking on some larger sewing projects once I have my mending out of the way. November was long and hot, with strong winds and very little rain. Some areas around us had a decent storm, with 50-100 mm, but we missed out, so had to keep the garden going with grey water and a little tank water. The extra shade cloth has made a huge difference, as has my sunken herb garden. I also downsized early and only water the two middle garden beds, everything else is struggling, but its better to keep two good beds than four average ones. For a few plants around the outside I used upturned beer bottles filled with water every few days. Its not classy, but it keeps the soil moist. For that reason, the harvest has not changed much. Mostly kale, silver beet and herbs. I finally picked the three lemons on my potted lemon tree and they were delicious. We had a few beans and cherry tomatoes, but not much yet. I can see the first button squash forming and a promising watermelon, so we just have to keep up the water and we might have more to harvest next month.